The main grass cutting season has come to an end and although we’re still very busy and in demand with numerous jobs, it’s also time to reflect upon the growing success of the project and our full order books. Long may it continue! 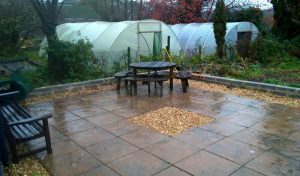 The team in North Somerset is now offering employment days on Wednesday and Thursday and they too are finding the work they’ve undertaken has been varied and interesting throughout the year; we’ve designed and landscaped gardens for customers, and brought gardens back from looking like a jungle, to areas where you’d like to sit quietly and enjoy the surroundings. Fencing enquiries and works have increased recently, most likely because the climate is changing and the weather is becoming windier. 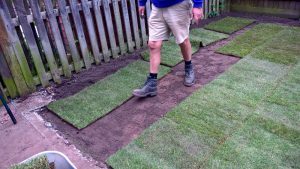 We’ve undertaken numerous turfing jobs throughout the summer and autumn, using high-quality grass which gives an instant effect. Our customers have been very happy with our work. Winter has now arrived and we’re busy delivering logs to pubs and domestic households. We’re about to start installing stock fencing at Elm Tree Farm, however we have domestic fencing jobs to do as well. We also have tree work to complete; pruning fruit trees, as well hardwood trees, and cutting down some small trees. 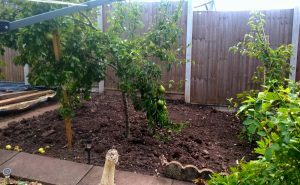 The team at Grounds & Gardens is multi-skilled and, as the brief reflection of our year shows, we’ve undertaken and completed many different tasks. If you’re looking for logs for your winter fire, need fencing replacing or your trees pruned, call us on 0117 958 6779 for Bristol enquiries, 07464 670 317 for North Somerset enquiries, or use the enquiry form on the contact us page.